He was like a fresh air in this southern city of Taiwan, especially during the long humid summer. Many would easily see why his favorite song was "Comfort Ye...My People" from George Frideric Handel's Messiah. In many ways, C T Lin was there to comfort people. His life was the combination of family, music, education and communities. Mr. C T Lin was a cultural man of Tainan with much sense of humor. Throughout the majority of the 20th century, few people could ignore his contributions to the city of Tainan in music, education, and many other cultural activities. He had taught at Cheng Kong University (成功大學), Chang-Jung high school (長榮中學) and served as the acting principal of Kuang-Hoa Girls high school (光華女中.) Lin also served as member of the board for both Chang-Jung and Kuang-Hoa. Besides volunteer work at the local Rotary Club, he held a job as the vice director of the United States Information Services (USIS - 美國新聞處) in Tainan. Lin probably knew enough of the dark side of the politics and propaganda, he chose to promote more of the western cultures in the form of literature and music. He was open-minded with open heart. He had become an integrated person with the combination of rich oriental traditions of Taiwan and Japan plus the newer life style of the West. Lin, a tall handsome man, with some gray colored eyes and straight nose, was very much respected by everybody who came across him. He graduated from Chang-Jung high school and Waseda University (早稻田大學) in Japan with major in economics. While in Japan he began to court a lady pianist Miss Huang (黃蕊花.) He once brought his violin and asked her to accompany him in practice. That was a “pickup line” few could borrow. Lin must be one of the few men then to ‘arrange’ their own marriages instead of waiting to be arranged. 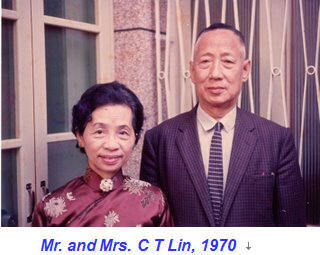 Lin later married Huang who became a life time church organist/pianist and also taught music at Tainan Girls Middle School (台南女中) for more than 40 years. The marriage turned into a famous family of musicians (five boys and two girls, all college/professional schools graduated) - like an ensemble orchestra with excellent pianists, violinists, cellist and vocalist. Some examples: Yung-Choen (永全,) an architect, once won the Taiwan’s violin soloist champion where Amy (惠美), Lin’s youngest daughter, was the pianist for a 5000+ grand choir when Rev. Billy Graham visited Taiwan many years ago. One walked into his home, and most likely would run into a free concert. During the middle of the 20th century, seldom concerts in the city of Tainan could have been without him. Lin developed his “love for all people” life philosophy while working under Chang-Jung Principal Rev. W.E. Montgomery (滿雄才牧師) who was also the president of Tainan Theological College during 1925-40 and 1948-49.